President Jimmy Carter and Vice-President Walter Mondale walked slowly out the front doors of the National Cathedral in Washington, D.C. President Carter had just finished his eulogy of 46-year-old Marvella Bayh of Enid, Oklahoma, the first Presidential eulogy ever given in the National Cathedral. 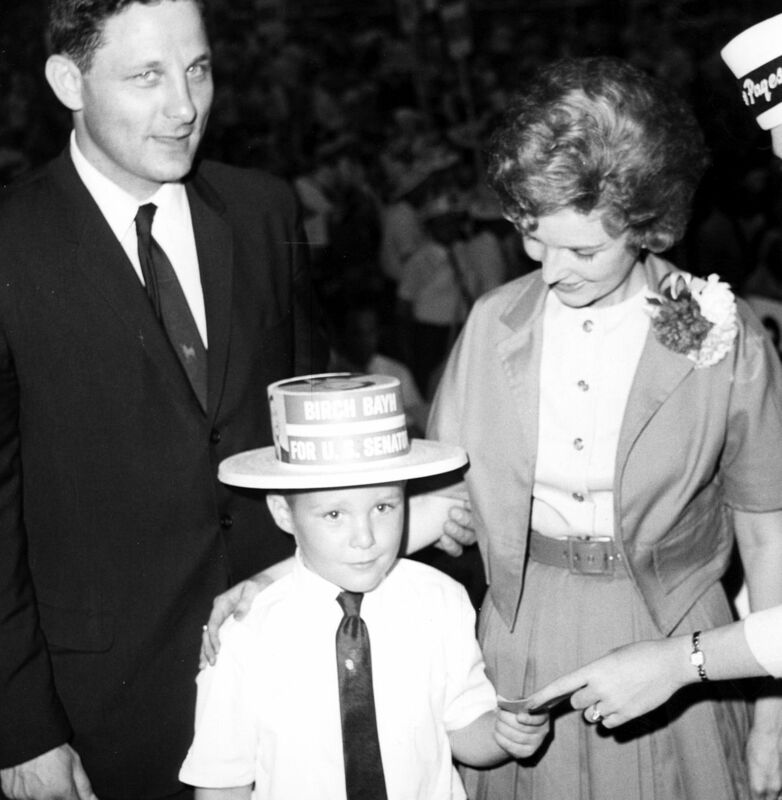 Marvella's widowed husband, Indiana Senator Birch Bayh, remained inside with the couple's only son, 23-year-old Evan Bayh while the other funeral guests filed out of the service. Across the street photographers and cameramen aimed their lenses at the cathedral's doors to catch a glimpse of the dignitaries who had honored Marvella with their tributes at the funeral memorial. Behind the President and Vice-President walked Lady Bird Johnson, The former First Lady's tribute to Marvella moved many to tears. President Johnson had died suddenly of a massive heart attack just six years earlier, and Lady Bird spoke knowingly and emotionally of the pain involved in losing a loved one from premature death. The Bayh family had been frequent dinner guests of President Johnson and Lady Bird during the Johnsons' tenure in the White House. Next out the doors came Senator Ted Kennedy. The Senator from Massachusetts had often told people that Evan and Marvella Bayh had saved his life. The Bayhs were the Senator's guests in a small plane that crashed while flying to a political fundraiser on June 19, 1964. Senator Bayh was the keynote speaker for the fundraiser on behalf of Senator Kennedy. The plane crash killed the pilot and an aide and had it not been for the heroic actions of the Bayhs, the crash would most likely have killed Senator Kennedy too. Senator Bayh and Marvella were also injured in the crash, but Senator Bayh dragged an unconscious Kennedy from the burning plane while Marvella sought help from a nearby farmhouse. Dozens of U.S. senators and representatives, federal judges, and Carter administration employees filed out next. Many, from both sides of the aisle, were personal friends with the Bayhs. Following the politicians walked evangelist Oral Roberts who had brought the message from Scripture. Next to Mr. Roberts was Pat Boone, who had sung Marvella's favorite gospel hymn "Where Could I Go But to the Lord" during the service. After about 10 minutes, Senator Birch Baye and his son Evan Baye came out of the cathedral, holding red roses. The date was Friday, April 27, 1979. The Enid police officer policeman opened the front door of the little home at 2024 West Oklahoma in Enid, Oklahoma on a cool Wednesday morning, April 1, 1970. The officer discovered what he'd been told he would find. Delbert Hern, 60, was reclining in his chair, dead, with a 32-caliber gun still lodged in his hand. On the floor lay Mr. Hern's 35-year-old deceased wife. She'd been shot once in the head. Police would later say she'd been shot and killed while lighting a cigarette. The Enid police had been called to the home by Kermit Wood, a man who rented the apartment behind the Hern home. Mr. Wood had stopped by the Hern house to pay his rent. That's when he discovered the bodies and called the police. Garfield County Assistant District Attorney Norman A. Lamb would later tell reporters that the deaths were "an apparent murder and suicide." Mr. Delbert Hern was the father of Marvella Belle (née Hern) Bayh, the wife of Indiana Senator Birch Bayh, the man many considered to be the frontrunner for the 1972 Democratic Presidential nomination to challenge Republican President Richard Nixon. Delbert Hern had remarried after Marvella's mother, Bernetta, died in April 1964, her death the culmination of years fighting debilitating physical illnesses. Those in the Enid community who knew Mr. Hern, saw him begin to struggle with alcohol after the death of Bernetta. The woman he'd shot and killed before turning the gun on himself was twenty-five years younger than he, and they'd not been married long. Senator Bayh and Marvella were in Monte Carlo, Monaco when news of the tragic deaths reached them. Marvella flew from Europe to Oklahoma to take care of her father's and step-mother's funeral arrangements. One week later, Marvella Belle Bayh gave the eulogy for her father. Those present at the service remarked at the poise and eloquence of the only child of Delbert Hern. Marvella, full of emotion, shared the love she had for her alcoholic father, encouraging people to remember who Delbert was, not who the abuse of alcohol had led him to become. Long-time Enid newspaper writer and historian Phil Brown once remarked to me, "Marvella's words at her father's funeral composed the most moving funeral eulogy I've ever heard." Less than nine years later, Marvella Belle Bayh would die after a courageous battle with breast cancer, leading to many more eloquent words spoken by others at her funeral. Marvella Bayh may be the most famous woman from Enid, Oklahoma that a younger generation of Oklahomans has never heard about. I hope to change that in this post. In my opinion, Oklahomans, especially people from Enid, should remember and honor this remarkable woman. Marvella Hern was born February 14, 1933, in Enid, Oklahoma to Delbert Hern and Bernett E. (née Monson) Hern. Marvella's mom had complications during pregnancy and delivery, and after she gave birth to her daughter that she named Marvella Belle Hern, Bernett Hern suffered complications that led to years of physical disability, and the inability to bear any additional children. But Marvella Belle thrived as an only child. Her father, Delbert Hern, was a successful farmer near Lahoma, Oklahoma, a little town just southwest of Enid. He chaired the Garfield County Democratic party, raised cattle and wheat, and doted on his only daughter. After the family relocated to a home in Enid when Marvella was a teenager, she attended Enid High School, becoming the first female to be elected President of the Enid High School student body. 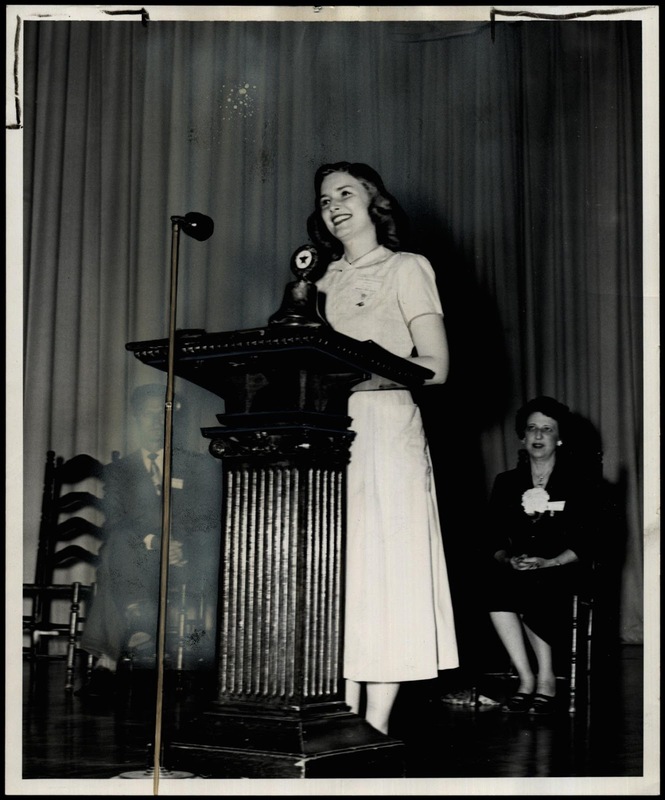 In 1949, the fall of her junior year at EHS, Marvella Hern was elected Girls' Nation President. Marvella met with President Harry Truman in Washington, D.C. and she traveled to many different states, representing Girls' Nation. Marvella returned to Enid in time for her senior year of high school, graduating in the spring of 1950. In 1951, during her spring freshman semester at Oklahoma State University, Marvella Hern entered the Oklahoma Farm Bureau's extemporaneous speaking championship. "I didn't win, but I do expect to win the girl who did." After a brief courtship, Birch Baye and the Enid, Oklahoma girl married on August 24. 1952. Birch and Marvella moved to the Bayh family farm near Terre Haute, Indiana, and Birch tried his hand at farming. Marvella transferred her credits and began attending Indiana State University part-time while supporting her husband's farming venture. Marvella was the guiding force in her husband's life. It was Marvella who urged Birch to run for the Indiana Legislature in 1954, to go to law school at Indiana University and to run for the Senate in 1962. In the Senate race, Birch Bayh defeated the longtime incumbent, Homer Capehart, in what was termed a political upset. Many credited Marvella for the victory. She often was the main speaker on the stump trail, and people were giving her standing ovations after making the case why Indiana voters should vote for her husband. Speaking didn't come as easily for Marvella as it did in college. Birch E. Bayh Jr., 26 years old, and his wife, Marvella, 21 years old, are patients at a Lebanon, Missouri hospital as the result of a two-car crash near that city Thursday night (February 18, 1954). Bayh is reported to have suffered cuts and bruises and Mrs Bayh serious chest and head injuries. Bayh was said to have been driving over the top of a hill when the two cars collided. He and his wife were on their way to Enid, Oklahoma, to visit Mrs. Bayh's parents. Marvella would suffer from double-vision for the rest of her life because of the accident, but through perseverance, she managed to graduate from Indiana University in Bloomington in 1960 with a degree in education. After Birch Bayh won his Senate race in 1962 and moved to Washington, D.C., Marvella Baye became a sensation in the nation's capital. She was called "The Jackie of Indiana." The Bayhs enjoyed company with President Kennedy and First Lady Jackie, and the social columns of the newspapers identified Marvella as "the most intelligent and most beautiful woman in Washington." "There is a great deal that I liked about Marvella Bayh. Marvella, who was more than ten years younger than I, came to Washington at the beginning of 1963, just after her young husband, Birch Bayh, was first elected to the Senate as a Democrat from Indiana. She experienced Washington in the 1960's as 'a wife of...', just as I did before Phil's death and my own going to work. Marvella worked just as hard as Birch to settle in -- doing everything from buying and furnishing a house, making a home for their son, Evan, while her husband flew back and forth to his home state nearly every weekend, and keeping up with all of the issues that it was so necessary to understand." On June 19, 1964, Senator and Mrs. Bayh were in the aforementioned plane crash with Senator Edward M. Kennedy, Democrat of Massachusetts. In late 1964, Marvella was named "Indiana Woman of the Year" by the Indianapolis chapter of Theta Sigma Xi. A year later, she was chosen one of the "Outstanding Young Women of the Nation." The citizens of Enid, Oklahoma recognized Marvella with the "Pride of the Plainsmen Award" in 1967. Marvella's husband, Senator Birch Bayh, became Chairman of the Subcommittee on Constitutional Amendments. In that role, Birch Bayh authored two constitutional amendments, the only person other than a Founding Father to author two amendments to the United States Constitution. The Twenty-Fifth Amendment establishes procedures for an orderly transition of power in the case of the death, disability, or resignation of the President of the United States. The Twenty-Sixth Amendment lowered the voting age to 18 throughout the United States. In 1971, just six months after speaking at the her father's funeral, Marvella Bayh was diagnosed with breast cancer. Birch Bayh dropped his campaign for the 1972 Democratic Presidential nomination to be with his wife during her recovery from breast surgery. After a successful surgery and treatment, Marvella's cancer went into remission. Marvella Bayh became the nation's spokesperson for the American Cancer Society. From 1972 through 1978, Marvella Bayh gave nearly 200 speeches across the nation, countless interviews, and stood before Americans as the face of courage in the fight against cancer. In late 1978, her cancer came back. "When they told me there was treatment but no cure at this time, I dropped to my knees. Two things from out of my past, when I went to church as a child, came back to me. Number one, 'Where can I go but to the Lord?' and Number two, 'I am weak but He is strong." "When life comes down to basics, really how little control we all have over our own lives.' And it also came to me how, even if we live to be 100, how really short life here is. And therefore, it's important to enjoy it and not rush so fast and take time to smell the roses . . ."
Marvella son, Evan Bayh, would go on to become Governor of Indiana and U.S. Senator from Indiana. Like his father Birch, Evan would run for the Democratic nomination of President of the United States. The petite, blond girl from Enid who could move audiences with her eloquent speeches must not be forgotten, especially by those of us who live in Enid, Oklahoma. I don't know if Evan Bayh will ever read this post. But if he, his father Birch, or his kids ever do, I want them to know that at least one current Enid resident understands what the Bayh family has known for decades about Marvella Belle (née Hern) Bayh. She was one remarkable Okie. Postscript: If you would like more information about Marvella's life, you can purchase her autobiography called Marvella: A Personal Journey. That reminded me of a story told at the funeral of Everett, a relative of ours. Our father was campaigning for Superintendent of Schools when he had a flat on his car in front of a farm house. Everett took the flat on his bicycle to town a mile away. He also took my father’s niece to hold the tire. "Marvella, full of emotion, shared the love she had for her alcoholic father, encouraging people to remember who Delbert was, not who the abuse of alcohol had led him to become." Good to remember that a person is so much more than his sins. "4 Love is patient, love is kind. It does not envy, it does not boast, it is not proud. 5 It does not dishonor others, it is not self-seeking, it is not easily angered, it keeps no record of wrongs." Well, Wade, I have to say that this post marked a tipping point for me. I have now read so many amazing historical stories from this blog, that I am officially assigning it as reading for my 9th grade (homeschooled) daughter. The snippets of history and historical figures you highlight are those I would never find in curriculum elsewhere. Thank you! Oh, and as a direct descendant of John Brown, I loved your recent post of him as well!